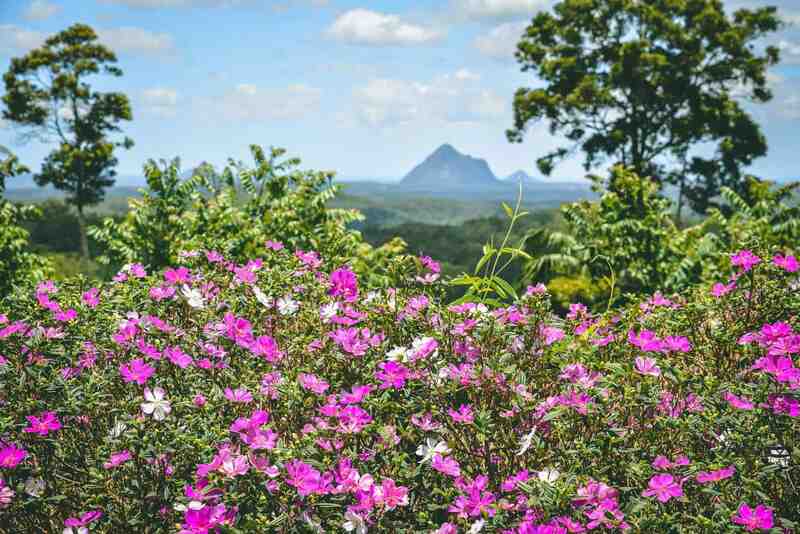 The Maleny Botanic Gardens is a beautiful place to visit during your stay on the Sunshine Coast. 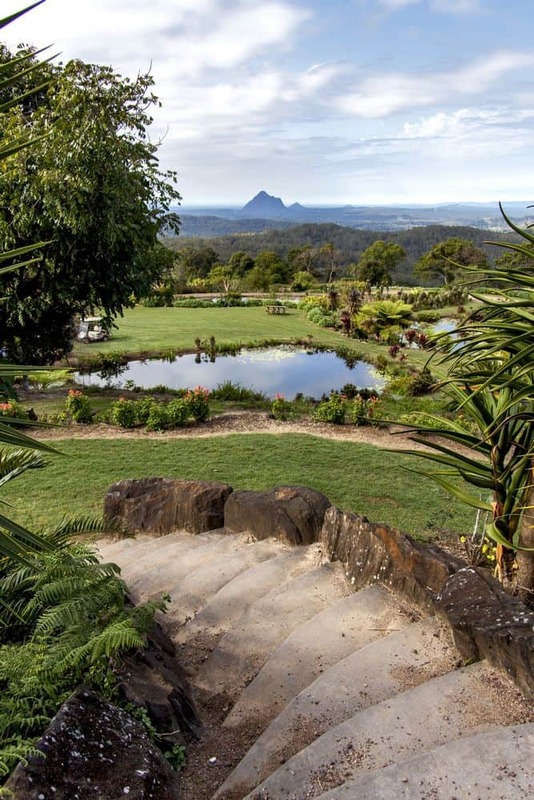 With over 14 acres of gardens and lawns and located on over 110 acres, many people come here to enjoy the magnificent rainforest setting and spectacular views of the Glasshouse Mountains. When attending the gardens, you will discover over 6kms of walking paths where you can discover thousands of plants and flowers including roses, azaleas, cycads and so much more. On your walk, you will also discover lakes and waterfalls that are dotted throughout the property. An aviary has also been opened on the property which currently houses over 300 birds including cockatoos, lorikeets, parrots and macaws. Guided walk through tours is offered daily with tours lasting between 30-40 minutes. On the tour, you will be lead by an experienced guide who will introduce you to their huge range of birds and you may even be lucky enough to have a bird land on you, but only if you stay completely still! Tours are run on demand and usually start around 10.30am daily and run every 1.5 hours. 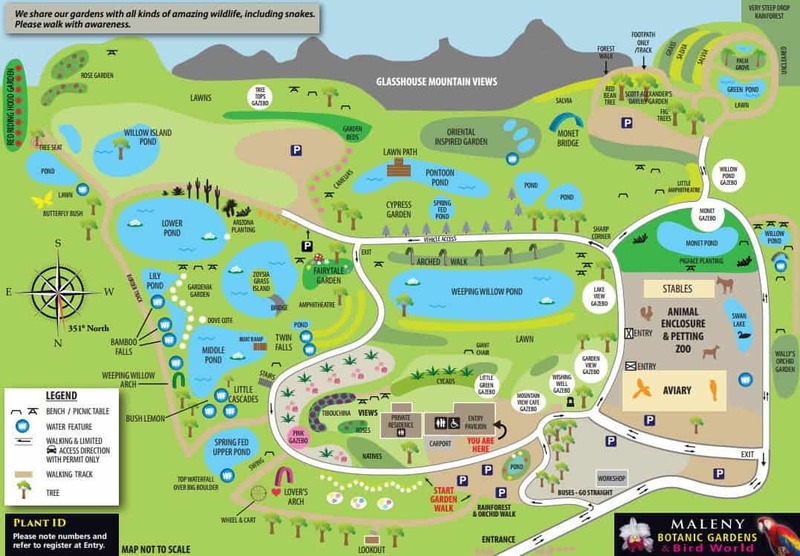 Make sure you check out the barnyard which sits next to the aviary where you can meet alpacas, goat, sheep, chickens, ducks and guineafowl, as well as a miniature horse and donkey. Picnics are welcome on the expansive lawns and dogs are welcome. Entry to Maleny Botanic Gardens is via a concrete driveway, with ample parking on site. For those with strollers or wheelchairs, there is access to most of the gardens as there are paths with mostly firm gravel and lawn, but some paths have loose gravel which may make access difficult. Maleny Botanic Gardens located via the Bruce Highway and Steve Irwin Way on Route 24. If you are looking for accommodation on the Sunshine Coast, click on the link below to find the best deals. How much does the Devonshire tea cost? Do you have gluten free scones available as I want to bring a friend who is gluten intolerant? The cost of a Devonshire Cream Tea is $11, which includes 2 scones with jam, cream and tea or coffee. For visitors who would prefer a Gluten Free option, they can choose from orange & almond slice, chocolate slice or a GF muffin for only $12 (also including tea and coffee).